Produktinformationen "Acts and Scenes: Western Drama in Korean Theater"
Almost 400 playwrights from about 25 countries and more than 1,000 dramas have been introduced to Korea in the brief span of 100 despite the fact that Korea has a vastly different culture, history, and tradition. While the history of Western theater spans 2,500 years, it has been less than a hundred years since translations of Western drama were first staged in Korea. Therefore, to understand 20th century Korean theater scene, it is necessary to examine how Western drama took root in Korea during the late 19th to the 20th centuries. Acts and Scenes: Western Drama in Korean Theater is a brief overview of how Western drama was introduced and developed in Korea. The book is mainly divided into nine parts and outlined with notable examples of theatrical accomplishments: (1) the introduction of Western theater at a time when sinpa theater companies coexisted with the singeuk movement; (2) the contribution of university theater and the theatrical activities of college students who regarded the acceptance of modern Western drama as a means to enlighten the nation; (3) the establishment and activities of the National Drama Company that provided an opportunity for Korean theater to enter the specialized stage of theater; (4) contemporary American plays that have been imported in exceptionally large numbers to Korea since the Korean War; (5) the foundation of a number of coterie theater companies; (6) the little theater movement; (7) the influence of the international theatrical artist Bertolt Brecht, who was introduced relatively late to Korea due to political considerations; (8) changes in the performance characteristics of plays by the most performed playwright Shakespeare; and finally, (9) the most performed play, Waiting for Godot by Samuel Beckett. Understanding the history of Western drama in the Korean theater scene, which has shifted and progressed in the currents of social transformation, means figuring out just how Korean society has been transfigured. Korean playwright always sought to internalize while using imported techniques to reflect Korean sensibilities, including the individual artists’ personal styles. Now, western drama in Korean theater scene have moved away from the phase of staging productions faithful to the original play and finally entered the phase of using it as a rich source for new theatrical creations. 일제강점기 내내 대중적 인기를 누린 신파극과, 민중 계몽의 수단으로 서구 근대극을 적극적으로 연구하고 소개했던 지식인들의 신극 운동을 살펴본다. 신파극 인습을 버리고 현대극으로 발전하는 데 중요한 역할을 한 대학극의 전개 양상을 소개한다. 국립극장에서 공연된 주요 번역극 레퍼토리를 소개한다. 반파시즘의 성격을 가진 미국 연극의 도입을 한국의 사회•문화적 배경 속에서 살펴본다. 소극장의 탄생, 실험적 작품들과 부조리극 열풍, 그리고 브로드웨이 뮤지컬 도입에 대해 알아본다. 현재 150개가 넘는 소극장이 운집한 대학로는 1980년대 부터 ‘연극의 메카’로 부상하게 된다. 20세기 연극사에서 가장 주요한 인물로 손꼽히는 세계적인 극작가 브레히트가 한국에서만큼은 제때에 수용되지 못하고 뒤처지게 된 정치, 문화적 배경을 살펴본다. 원작에 충실한 작품으로부터 실험 정신과 변용을 시도한 각색 작품에 이르기까지 한국의 다양한 셰익스피어 레퍼토리들을 만나본다. 베케트의 부조리극 「고도를 기다리며」가 한국에서 가장 많이 상연된 단일 작품이 된 배경을 살펴본다. 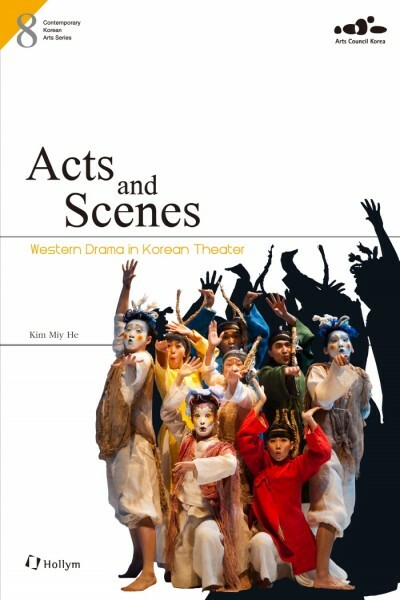 Weiterführende Links zu "Acts and Scenes: Western Drama in Korean Theater"
Unser Kommentar zu "Acts and Scenes: Western Drama in Korean Theater"
Kundenbewertungen für "Acts and Scenes: Western Drama in Korean Theater"